The Inevitable Collision of Birdie & Bash took me by surprise in the best of ways. This cute, shockingly deep contemporary is the epitome of not judging a book by its cover. You look at the pretty swirls, the bright red and purple, and the roller skates, and you think it’s just another sugary contemporary – oh how wrong you are. This book leads you in through a double-helix spiral. It is an emotional roller coaster that shakes, turns, and spins you out of sorts in the best way possible. 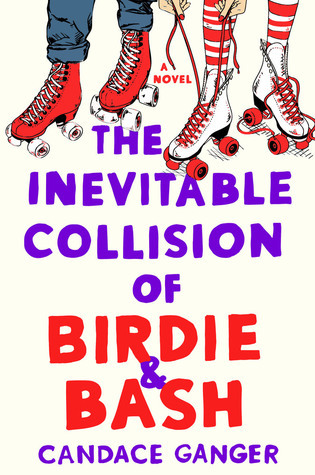 The Inevitable Collision of Birdie & Bash brings two characters together in the wake of a tragedy they are both deeply connected to in ways that will tear out your heart. This book also poses the question of truth and whether or not hiding the truth in order to protect someone is ever a reason to lie. It keeps you on your toes because you think you know which direction it’s heading, but then you realize you’re protecting what you want to happen and then WHAM, it all falls apart and you’re stuck in the rubble. Don’t let me scare you off, guys. While this book is definitely one that requires some tissue assistance, it is also filled with light and laughter in some unexpected ways. The characters are a hoot, especially Birdie. She’s smart, fierce, and so full of nerdness I couldn’t help but cheer. Bash is pretty awesome, too. In addition to the characters, the writing itself is humorous. It’s quick, chatty, and somehow effortless. The metaphors, the excellent characterization, and the overall emotional ride combine forces in The Inevitable Collision of Birdie & Bash to create something magical. The book will make you laugh, definitely make you cry, and it might even make you question some of your own choices. It’s fun, smart, witty, and emotionally traumatizing and I wouldn’t want it any other way.